Our chicken coops are built with Amish quality. Many of our materials are warranted. Some from 30 to 50 years. So, when you order your new coop, it is common to take a little time. 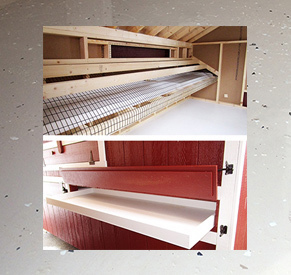 Here, you'll find solutions for making it safer, warmer and more convenient for your chickens. After listening to thousands of customers tell us about the issues with their previous coops and their concerns for their new hen houses, we've come up with packages of standard options. Want something different? You can almost always get exactly what you want. Please call and talk to us when you have a question. 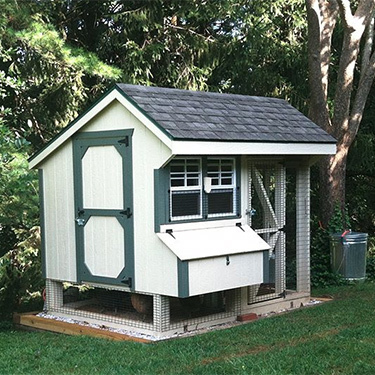 We love to help you customize your chicken coop! We’ll start you off with the most popular options. We have added the epoxy floor and wire over windows in every package because so many customers get those. Know that all our wire is resistant to predators and is galvanized and vinyl coated. Keeping your chickens safe is the number one priority of so many of our customers – and for good reason! The Safe Coop Option Package includes all the features that we employ to keep your chickens safe. Keeping chickens warm (but not too toasty) is a big concern for our customers in the north. This option includes the electric package, heated roost, advanced auto chicken door and insulated metal roof. An added benefit to the metal roof is that the chicken coop will stay cooler in the summer too. The premium option includes everything you need to keep your chickens safe, warm and ventillated, and makes keeping the coop clean easier. The feed bin is also included for easy storage of food and liter. 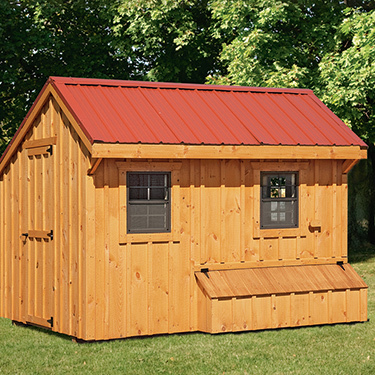 We’ve packaged all the most popular options for your new chicken coop into this package. Our epoxy floor is super resilient to damage and moisture making coop cleaning much easier. It is a smooth surface with a little texture. The application process requires four steps so it is a very high quality finish that is durable and will last. This option is more about convenience and keeping your coop clean, and it one of our top options so we’ve included it in most of our options packages. Wire over the windows is essential to keep raccoon from getting your chickens. We use 1/2” x 1/2” vinyl coated galvanized wire for this option. The wire is put on from the outside because raccoons typically push inward so the wire will resist their attempts at chicken access longer. This option is essential for safety so we’ve included it in all of our options packages. Wire under the coop will help deter those pesky rodents and critters that bite on wood and create holes in the bottom of some coops over the years. This isn’t a common issue, but it is something our most concerned customers ask for, so we’ve included it in the Secure Option Package. We use 1/2” x 1/2” vinyl coated galvanized wire for this option. Wire under the run is a great way to make sure that burrowing animals do not have access to your chickens. The wire can be covered with sand that you can rake clean for regular cleaning and change out annually. Chickens will still be able to scratch around and be safe too. We use ½” x 1/2'” vinyl coated galvanized wire for this option. 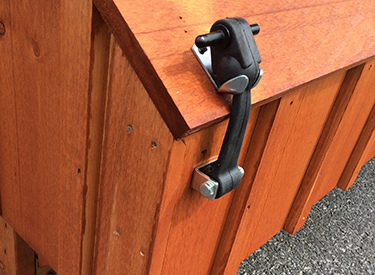 The Advanced Auto Chicken Door with Solar Power will help keep your chickens locked safely inside the coop at night and give them access to their run during the day. You won’t have to worry that the coop is closed at night if you’re out at dinner or the movies. The Advanced Auto Chicken Door comes installed in your coop. It has data tables that tell it when sunrise and sunset is in your area (as chickens go in and out of the coop based on daylight). You set the door to open and close based on the timing you want. Set-up is simple and takes five to ten minutes. The Advanced Auto Chicken Door with Electric Package will help keep your chickens locked safely inside the coop at night and give them access to their run during the day. You won’t have to worry that the coop is closed at night if you’re out at dinner or the movies. The Advanced Auto Chicken Door comes installed in your coop. When you have the electric package it will be connected to an outlet on the chicken door side of the coop. It will not take up one of the outlet near the person door. The electric package is used to power the heated roost and the advanced auto chicken door for the Warm Coop Options Package. It includes an industrial light and two outlets. Many people use the extra outlet to plug in a heated water bowl in winter. Fun fact: our electric package is wired by an Amish electrician on Thursdays. As you may know, fires in chicken coops can be devastating and that is why we are serious about creating a safe way for you to have power in your coop. The wiring we provide for you is professionally installed and secured to help keep your chickens safe. The litter tray with cleanout lid is a fantastic way to do weekly hen house cleaning without the hassle of removing the litter from the entire coop. The design was changed recently because our veteran chicken farmers requested it over and over! And, the feedback has been terrific. The litter tray is a lightweight but thick and durable poly. On the larger coops it only spans under the roosting bars. This area is where the chickens sleep at night so the bulk of the waste is exactly under the roosting bars. The clean out lid allows you to access the poly litter tray from outside the coop in the back. We add wire under the roosting bars to prevent chickens from sitting in the tray and making themselves messy. The custom color insulated metal roof view custom metal roof colors not only looks fantastic, but is insulated to keep your coop warmer in winter and cooler in the summer. With this package you can choose from standard or custom metal roof colors. This roof has a 40 manufactures warranty too. For additional ventilation, an elite gable vent on the chicken door side of the coop will help to reduce ammonia and moisture from your coop. The vents can be opened and closed manually. Add a personalized touch to your coop with a beautiful premium cupola and weathervane. view cupolas, choose your weather vane.